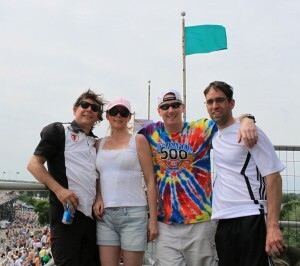 For nearly twenty years it’s been a dream of mine to attend the Indianapolis 500. When I saw the event live on TV for the first time in 1993 and watched as Nigel Mansell came within touching distance of winning the race as a rookie, I made up my mind that some day I would sit in the stands to watch the race in person. In May this year that dream finally came true, and the following is a detailed account of my trip of a lifetime. It was back in February when the idea of attending the centennial Indy 500 came to mind. We’d finally sold our house in Liverpool and I’d been given a raise, which along with some well timed freelance work meant that I could absorb the cost of travel. Initially we thought about making it a family holiday, with all four of us going to Miami and me disappearing up to Indianapolis for the weekend of the race. Financially it just didn’t make sense, though, so it came down to a family holiday in Spain and me flying solo on my trip to see the Indy 500. I’d posted on Track Forum about the possibility of making it to the race, and asked for suggestions as to where to stay and what to try and do when I was in town. Not long after I posted I received a message from a guy called Patrick who had been around on the forum for about five years longer than me. I’d seen his posts, but I couldn’t say for sure if we’d ever had dialogue beforehand. “Just get youself to Indy – I’ll take care of the rest.” Patrick promised. It’s not often you get an offer like that – so much so that I suspected it was a prank. Over the weeks and months that followed we exchanged emails on the subject of me attending Indy, and swapped pictures of our families. Seemed like the man was friendly and legit’, and in fairness he was taking as much a leap of faith as I was. I could turn up and he could be a nut case. Or he could turn up at the airport and I could be a nut case. But by this point I’d booked the flights and thought it’d be interesting to see how things turned out. Sometimes you just have to roll the dice and see what happens! Despite a scare caused by a volcanic ash cloud wandering it’s way through the air space from Iceland, my flight to Philadelphia left bang on time on the Wednesday morning. 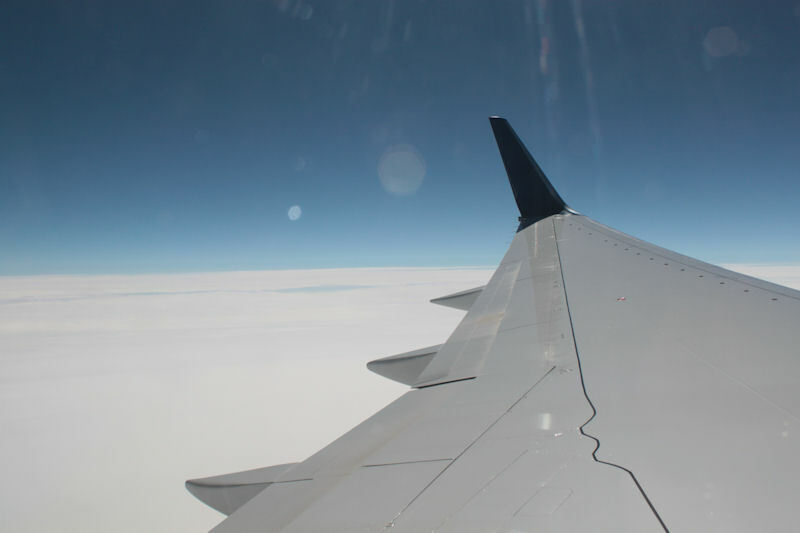 I actually quite enjoyed the trip – there was very little turbulence and the US Airways staff were pleasant enough. During the seven hour flight I beavered away on the laptop, getting in about four hours of freelance work and a couple of hours of updates for IndyCar Fan Zone. The latter put me in a great frame of mind for getting to Indianapolis, and the three hour layover at Philly couldn’t go by quick enough. The courteous but cold barmaids at the sports bar near the gate didn’t give a great impression of what that city had to offer in terms of hospitality. Neither did the woman at the gate, nor the flight attendant. Seems like you have to take it or leave it in Philadelphia, and I was glad I was just passing through. Even though the whole plane was being shaken around by turbulence on the descent to Indianapolis Airport, I was mindful enough to keep looking out of the window to see if I could spot the Indianapolis Motor Speedway with my own eyes for the first time. Sure enough, it passed below and to the right of us about five minutes before landing. My first impression was that it was huge. Of course, I knew it was big – I’ve seen it on TV and I know how long it takes to lap the place at over 220 miles per hour. But seeing it with my own eyes had the hairs standing up on my neck. The place is even more majestic looking from the air than I had expected, and here I was flying in from Scotland to see the race. Once landed and safely inside the terminal building I approached a member of staff at the airport to check that I should go and collect my case from the carousel rather than waiting by the gate as those with carry-on’s had done. The woman assured me that I was doing the right thing and welcomed me to Indiana. The contrast with Philadelphia was striking right away – I’d read of the Hoosier Hospitality on the forums, but it was plain as day that the mid-west folk were that much more friendly than those on the east coast. Having seen pictures of Patrick’s girlfriend in our email exchanges, I recognised Lisa straight away as the slim blonde waiting by the gate. Patrick was thumbing away at his phone, but looked up to greet me right away. Turned out Fliss had been in contact with him and was wondering if I’d landed yet. As I always find when I meet someone in real life whom I previously met on the internet, it can be a bit strange at first, because you’ve both made character assumptions based on communication by text. Patrick was just how I imagined him – friendly and laid back. 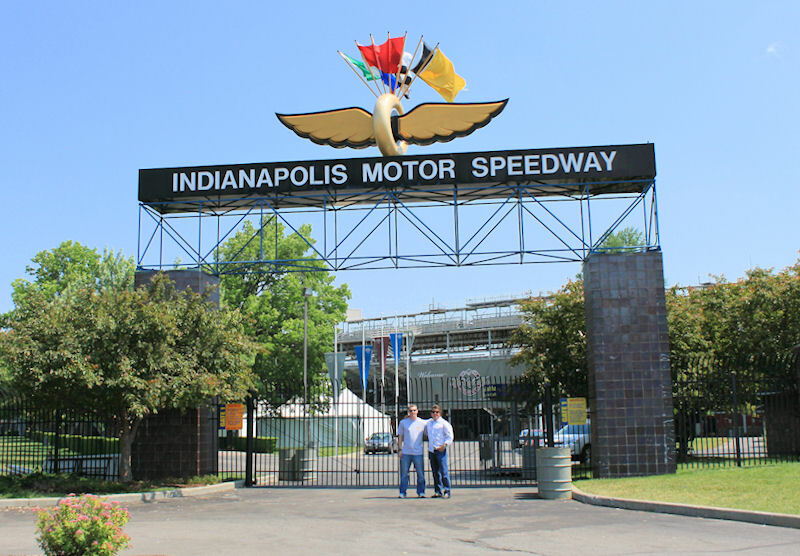 He ushered me in the direction of the Indianapolis Motor Speedway shop that was off to the right of the arrivals area, suggesting I grab some merchandise right away because it might be harder to get the things I wanted the closer it got to the race. This made a lot of sense – I’d left lots of room in my case for bringing back souvenirs, so I had a good browse of the shop and picked up a loud tie-die t-shirt and a few other trinkets. The bar adjoining the shop had a racing car mounted on the wall, and Patrick took a picture of me standing in front of it to send to Fliss to show that I’d arrived. After leaving the airport we headed to the Union Jack Pub for food. This was a pretty cool bar/restaurant filled with racing memorabilia – exactly the kind of place I wish we had in Glasgow. I wasn’t super hungry, probably because it was pushing 1am as far as my body clock was concerned, but I was keen to try a tenderloin. Finding out that I was Scottish, the waiter suggested I try the fish & chips. I wondered if he recommended that Italian people try the pasta? My mind was made up already, as my mental vacation clock was already ticking down with the knowledge that it was a short trip and I wanted to ensure I tried a tenderloin, along with all the other stuff I was there for. When the main meals arrived after our shared nacho starter, the portion was huge. The tenderloin itself was big enough that it would have done as a meal for me, but it came on a bun with a side of fries. I did my best to eat as much of the tenderloin as possible, but even if I hadn’t eaten all day I wouldn’t have done it justice. This was a shame, as it was pretty tasty! After eating at Union Jacks we headed back to Patrick’s place via the speedway. Driving alongside the west side of the track, it was impressive how long it went on for and how big the grandstands were. There’s just nothing like this in Britain – even a large football statium unfolded out with all the grandstands in a line would fall well short of the stature of IMS. I wanted to contain my excitement for the first time I saw the track from the inside, though, so with tiredness setting in I was glad to get back to “The Y” – the house Patrick shared with his friend David. The house itself was really cool – with a large open plan kitchen, dining and living area. As a fan of Grand Designs I really appreciate interesting homes, and this was one of the cooler places I’d been in real life. Patrick had a room ready for me, complete with an IndyCar Series banner hanging with the curtains – a nice touch! After I’d put my luggage in the room I joined him downstairs to watch the weather report on TV. Like the race tracks and restaurant portions, the weather forecasts in the USA turned out to be much bigger than what I’m used to! There was a team of four or five people in the Fox 59 studio, plus a couple of reporters on location, all building the tension as a storm front closed in on the Indianapolis area. Given the chance of tornado’s, the broadcast would occasionally be hijacked by a public service announcement warning of the potential for harm. For some reason I found the PSA was actually more scary than the weather report of what could and might happen. As a cold war kid, the stark black screen of the PSA with a repeating safety message and a warning klaxon was all I needed to feel there was some kind of impending doom on the way. Mindful that this probably wasn’t the first time a storm front had passed this area and nor would it be the last, I wasn’t really worried. With an early start in the morning I went to bed, and despite the sound of the wind whipping the trees outside, I was asleep in no time. Waking at 5:30 AM, I knew I hadn’t really gotten enough sleep, but Patrick had told me about this golf tournament that he and his buddies played in every year, the Thursday before the race. I don’t golf and I know from my limited experience that I’m pretty inconsistent at hitting the ball, but I’d been assured that having a bit of fun was more the point of the exersize than trying to make par. 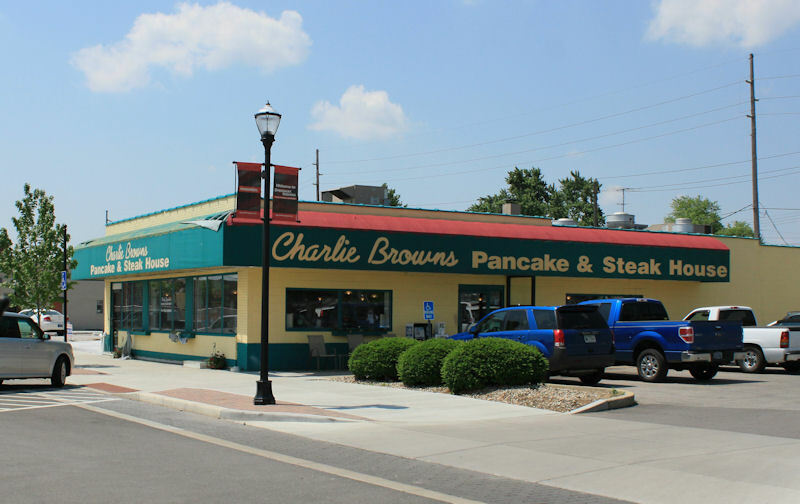 We went to meet Patrick’s relatives & friends at Charlie Brown’s diner, a block away from IMS. Like the Union Jack Pub, the walls were decorated with all sorts of racing memorabilia, with a fine looking collection of model cars on display by the door. 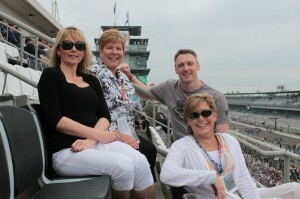 Despite the hour, that Hoosier Hospitality was in fine form and the place was buzzing with early morning diners. Due to the proximity to the race track it was common to see team members in, and sure enough we saw a few guys from Penske Racing arrive whilst we were having breakfast. Once we were done at Charlie Brown’s we headed to the golf course, which Patrick had told me was a “goat ranch” that did not require me to wear proper golfing attire. I’m not fully up to speed with golfing lingo, so I took this quite literally and wondered how many goats there’d be, how we’d avoid hitting them if they got in the way, and if they’d be friendly goats. 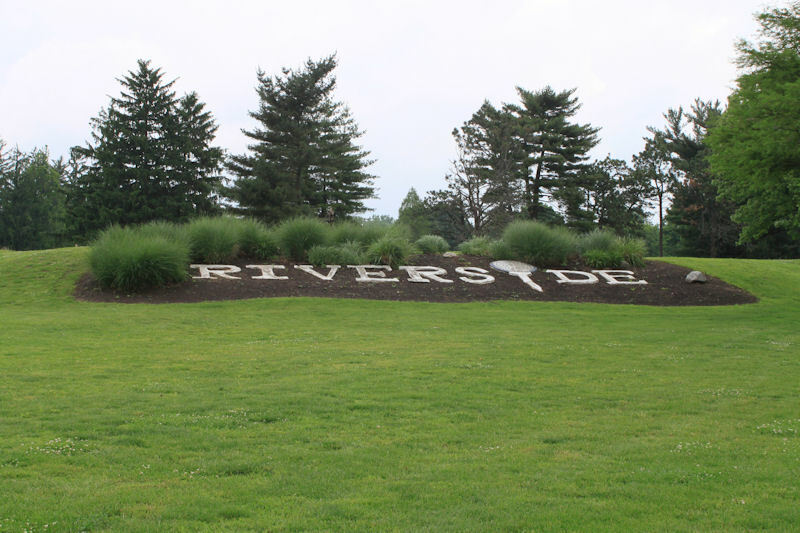 Man, I’m so glad I didn’t mention them on the way, because there were no goats, and Riverside was a perfectly nice golf club by my standards. As we drove through the entrance to the car park, Patrick told me that it was a public golf course, which meant anyone could turn up and play, so it didn’t matter that I wasn’t a member. This had not occurred to me – mainly because didn’t see why I’d need to be a member to play amongst goats! The golf went as expected, in that not only was I a very poor golfer, but it was quite good fun at times. We played in pairs, with the best of the shots taken by each player being used as the starting position for the next shot played. Patrick was my partner and he was very good. By virtue of his good tee and approach shots, I got to sink some putts of less than five feet to make it look like I was holding up my end of the bargain. As the afternoon wore on my tee shots improved a little, after I’d dialed out some slice with some advice from Brett, one of our playing partners. Patrick’s old school mate Mark was Brett’s partner, and he and Patrick spent a lot of time winding each other up as the afternoon wore on. Mark had very fancy looking clubs, but sunk more cans of beer in the course of the afternoon than he did putts! It was quite the rainy afternoon in the Indianapolis area, and several times we had to take shelter by parking our buggies under big trees when a sudden downpour arrived. After weeks of rain back in Scotland I had hoped for warm sunshine while I was in the ‘States, but so long as it was dry for race day I didn’t really care about getting a tan. At one point, Patrick got my attention and told me to listen to a high pitched sound coming from off in the distance. 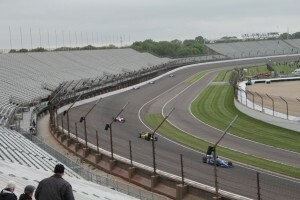 It was the Indy Lights cars running their practice laps. I had no idea how far we were from IMS, but thought it was wicked that we could hear the cars from the feeder series all the way out on a golf course. I wondered how loud it sounded when the IndyCars were running. As we neared the end of the round, Patrick said that he hoped we didn’t bump into his mother whilst we were driving around drinking beer. I didn’t get much of a chance to wonder why a grown-up should be worried about that before he explained that it wasn’t because she’d give us a hard time, it was because she’d want some of it! I thought that was kind of funny, but wasn’t sure whether it was a gag or not because it seemed kind of unlikely that we’d bump into his mother. One hole later and this golf cart approaches us with two females onboard. Surreal as it was, it wasn’t a gag and, sure enough, they wanted beer! Patrick’s mom seemed like a fun lady, and it was good to meet Chris for the first time, too. She had flown in from California the night before I had arrived and, not that I knew it at that point, but I’d be spending a lot of time with her over the next couple of days. We finished our round ten over par, and after waiting a while chatting with the others who had completed their rounds we decided to cut and run, as it was already mid-afternoon. On the way Patrick introduced me to “Tips” – rib tips done in a barbecue sauce that were probably about as bad for you as they were delicious. Still, they filled a gap and I just lapped up any Americana I could get my hands on. When we got to the speedway, I had no idea that you could just drive under the track and into the infield. That was pretty cool in itself, but the fact you could park so near the pagoda for free and wander around the place I thought was awesome. 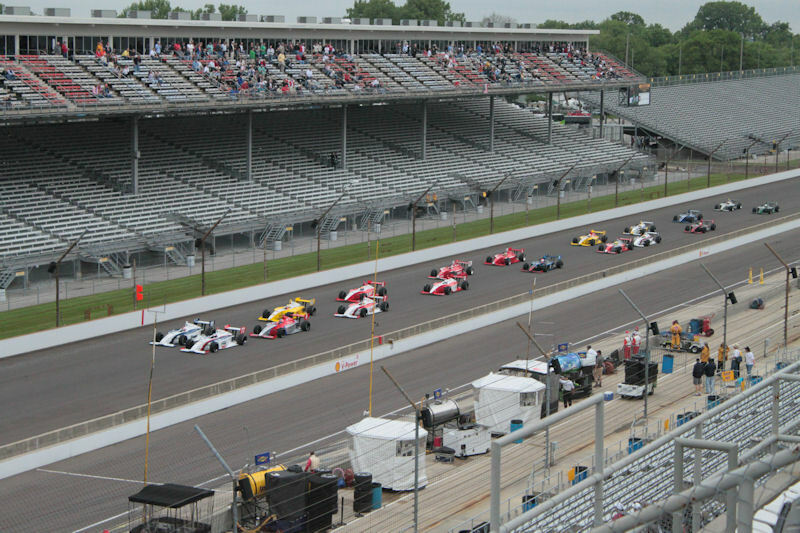 Not knowing how close I’d get to the track, I was reeling off pictures from inside the car, but within five minutes I was standing behind metal railings by the yard of bricks in front of the pagoda, watching as safety trucks did laps of the track to dry it off. Patrick said to a pair of yellow shirts (IMS staff all wear yellow polo shirts) that I had come all the way from Scotland. They came over and dragged the metal railings open to let me through, and said I could go out onto the pit lane to take as many pics as I wanted. Right away I was both thrilled at the opportunity and gutted that it was such a dull, overcast day for it. All the same, I took a bunch of different shots, before one of the yellow shirts (who had ancestors from near Aberdeen, naturally!) 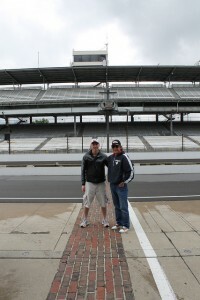 used my camera to take some snaps of me & Patrick standing on the yard of bricks together. 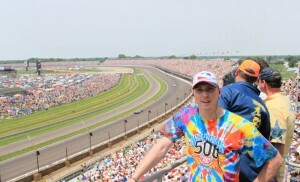 Obviously you have to be a fan of the Indianapolis 500 to understand the significance of the above, but it’s not every day you get to fullfill an ambition you’ve had for close to 20 years, so I was delighted I got the chance to walk out there, even if I didn’t make it onto the track itself. As we were leaving the pit area, Danica Patrick was driven by in a cart with the rain hoods on it. She’d been doing an interview beside the pagoda the whole time we’d been there, but I’d been so captivated by the track that I hadn’t even noticed her. 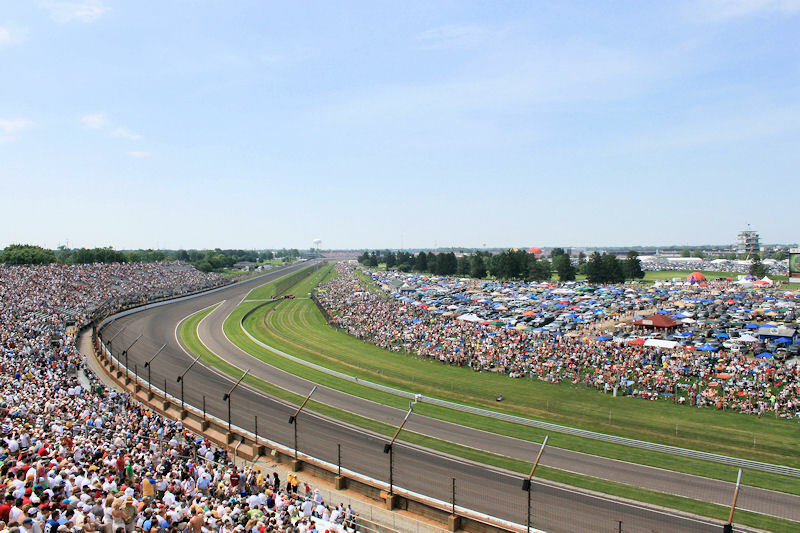 That’s kind of fitting, in a way – she’s a big star, but it was the Indianapolis Motor Speedway that made her famous. We walked to the museum via the garages, spotting a couple of drivers milling about, but mostly crew members standing chatting. Entry to the museum was $10 and came with a nice programme – cheaper than I expected it to be. 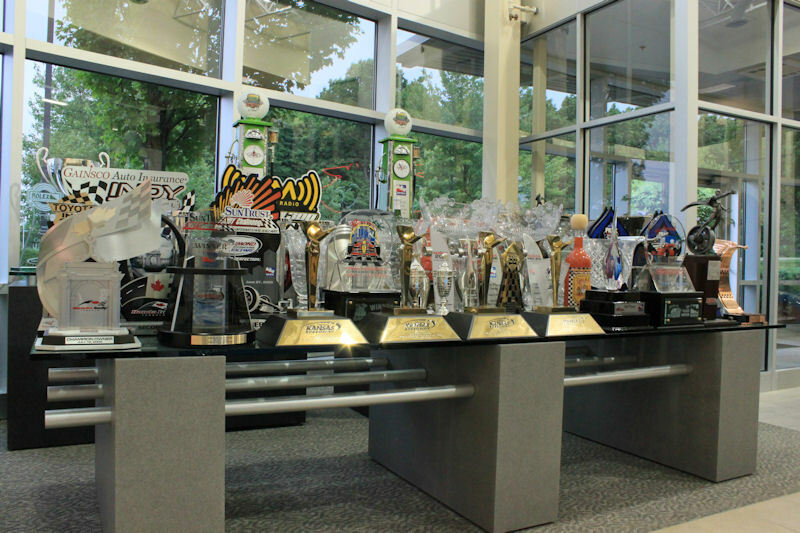 For the centennial ‘500, every winning car had been placed in the museum, so the content wasn’t as diverse as it normally is. I didn’t mind that at all, as there was one car I really had to see, and that was Jim Clark’s 1965 Lotus. 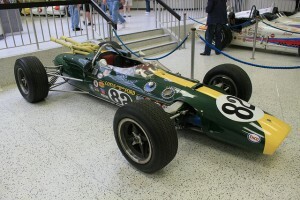 It was sat by a set of stairs at the end of a row of cars that featured Mario Andretti’s 1969 winner and AJ Foyt’s 1970 & 1971 winning rides – quite esteemed company. That Lotus is such a beautiful car – a sleek cigar shape that looks perfectly balanced. I know how dangerous motorsports was and still is, but it’s hard not to gasp internally at just how little regard there was for safety back in the day. That car is so small by today’s measure – even appearing small in comparison to its peers from the same decade. It’s hard to imagine how Clark wrestled that little car around the speedway for 500 miles – I so wish I’d been able to witness that era in person, before the wings and aero came in. After a couple of laps of the museum, taking pictures of each car in turn, I returned to Clark’s Lotus to reel off a few more shots before we left. The romance of it is that a legendary Scottish driver took this little Lotus to victory in the greatest race in the world. Dominating the field by leading 190 out of 200 laps, and changing the game forever at the speedway by being the first rear engined car to win – essentially bringing to an end the front engined roadster era. And here I was within touching distance of it, some 46 years later. I could have spent hours in the museum, studying every car, but I’d seen what I came to see and taken some memorable pictures, so we moved on to the museum shop where I bought some presents for the family. The shop was another place where I could have spent hours browsing, but I knew we’d be back at the track the next day, so I kept it short. We walked back to Patrick’s Land Rover and made the journey home, making a pit stop just after we left the north end of the track to tighten the bolts on a rear wheel. Once we were back at the house I introduced myself to David, who was sitting at the dining table designing some kind of farm house. I find architecture a really fascinating subject and wanted to ask about what was working on, but decided not to interrupt him, so I joined him at the table and checked out the pictures from the day on my laptop. When Patrick joined us we spent the evening relaxing, as it had been a very long day. He ended up putting Avatar on for me, as I mentioned I hadn’t seen it, and somewhere along the line he went out and brought back food from Steak & Shake. Hadn’t had one of those before, but it was a nice burger. When the movie was done I went to bed, exhausted and aching from the golf – turns out it’s more physical an activity than it looks! I was up reasonably early on Friday morning, trying to use the wireless connection to speak to Fliss on Skype during what was lunch time for her. While I was sitting in the lounge attempting to do this, David asked me if I’d like some breakfast made. He appeared to hover around the kitchen area quite a bit, eating healthy foods, so it wasn’t much of a surprise when he said he’d cook me up something good whilst we waited on Lisa getting ready. What he made was a mix of oats, something called quinoa (which he showed me the information for in a book), blended with almonds, raisins and honey. It didn’t look too appetising, but it was so delicious that it was hard to believe it was healthy! I made a mental note to get the ingredients from David before I headed home, as it looked like the kind of thing I could manage with my meagre cooking talent. The drive to the track was uneventful, thanks to Patrick’s local knowledge, until we eventually hit traffic with about a mile to go. Patrick parked the Land Rover on some lady’s lawn and I paid her the asking price of $8 to do so, then we walked the ten minutes to the track. There was an entrance fee of $10 to get into the grounds – after that we had free run of the place, and took a seat high up in the NW Vista to watch the final 20 mins of IndyCar Series practice. Although none of the drivers seemed to be at full tilt, they were going plenty fast and doing a good job of running in a pack. It was cool to see the IndyCars up close for the first time. I’d seen the CART cars race at Rockingham in England in 2001, but they weren’t quite as fast there, and the turbo engines made a different sound. I reeled off a handful of pics and some video, but didn’t go crazy as it was an overcast day. With the weather set to improve over the weekend I figured that any shots I took today would pale in comparison to the ones taken on race day, but it was good practice to track the cars in the view finder, anyway. Once practice was over we walked down to the entrance by the main straight and went to meet Patrick’s brother, Bill, his sister Chris, and their mother. Bill had tickets to the corporate suite above, but not enough for all of us. Patrick took one for the team, saying he knew enough people that he’d find folk to hang with and enjoy himself anyway. I felt a little guilty about taking his place, but after a couple of days in his company I didn’t get the impression that he was a corporate suite kind of guy, anyway. Joining the others in the elevator, we went up to the suite sponsored by the city of Indianapolis. There was some buffet food on offer and free drink, too. Outside the suite there were a bunch of seats up for grabs, and after eating we headed out there to watch the Indy Lights race. It looked pretty good at the start, but succumbed to accidents like it usually does. It was actually a bit chilly, so, giving the drivers the benefit of the doubt, they must have been struggling for grip. I wandered back into the suite to get warm, grab a beer, and have a go of the iRacing simulator that was set up to one side. The guy that was on it was making it look tough to complete a lap, but it turns out he maybe wasn’t a gamer! His friends mocked him as I turned in some pretty fast lap times around the virtual rendition of Indy Motor Speedway, keeping an eye on the monitor by the bar for the race going green again. No sense in missing real cars lapping the speedway by pretending to do it myself! Patrick’s mother & sister had come back inside by the time I was done with the game, so I joined them in the corner for some more food and chat. All the while I kept having the realisation that I was actually there – sitting in a box suite at IMS during carb day, drinking free beer! There was a collective gasp inside the suite when the crash happened that caused the race to end under caution. 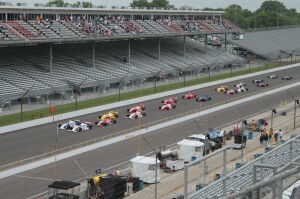 It was a heck of a hit – it’s amazing how much momentum the Indy Lights cars have, considering they look like toys on track compared to the IndyCars. A hush fell over the room as we waited on the safety crew attending to the driver who’d got the worst of it. It was then that I started hoping for a clean race on the Sunday. Seeing a bad crash on tv is one thing, but being at the track when it’s happened is worse because you know it’s real and nearby. When the Lights’ race had finished we made our way outside to watch the pit stop competition. This was a bit more entertaining than I thought it’d be, and it was cool to see the drivers milling about in the pit lane talking to their crews and each other. The crowd support was good, too – lots of cheering and applause for favourite drivers & teams. As is the American way, it didn’t feel embarrassing to whoop & clap for a good performance. People are too restrained at British sporting events uness it’s football or they’re drunk… or both. Lisa, Patrick's mother, Rob, and Chris. Whilst we were watching the competition unfold, Chris told me that she knew the crew chief of Ganassi Racing and could probably organise a tour of their HQ for me. I was eager to do this the next day if it fitted in with Patrick’s plans for the weekend. I didn’t know what else he had in store for me, and as he was my guide for the weekend I didn’t want to go freelancing on him. I’d spent the afternoon swapping lenses and taking shots & video of the action below, but it suddenly occurred to me that I had no pics of myself being there. Spotting a guy with a fancier Canon than mine, I got him to take my camera and snap a pic of us sitting there with the pagoda in the background. It came out pretty well, so I’m glad I asked the guy – we ended up talking cameras for a bit back in the suite. We left the suite shortly after and rejoined Patrick down behind the pagoda. He was standing with a good group of people by some planters, all of whom had had a few beers and all of them knew IndyCar racing. It was pretty cool just chatting with random folk and getting offered beer by strangers. I wondered if I should have stuck with Patrick initially, instead of going to the suite, but figured that I might not get the chance to be up in one of those again. Patrick, Lisa, and I took a wander in the direction of the carb day concert, but it was quite the walk and super busy over that way, so I didn’t fancy limping there on the injured right foot that I had. In the end we did a lap of where the motor homes were parked, came back around by the garages and returned to the planters. I visited the stores in search of the perfect hat and more t-shirts, but I didn’t buy anything that day. Did get talking to a friendly Australian fellow about how aerodynamics had blighted the modern era of racing. Not sure he agreed with me, but after seeing the fantastic wingless cars in the museum the day before I was on a crusade! We left shortly after that, making a slow trek back to the lawn where the Land Rover was parked. On the drive home we listened to the Carb Night Burger Bash edition of Trackside on 1070 The Fan. I was a bit sad I hadn’t got to go to that, but we were all tired and my foot felt like it was going to explode, so I was content to listen. On the way back we stopped at a fairly contrived looking farmers outlet to pick up some fresh food for dinner. I went in to help Lisa shop, and ended up carrying a huge watermelon for her. When we got back Lisa cooked us dinner while I looked at the day’s pictures on my laptop. Given how long a day it had been, we just chilled after dinner. I wasn’t sure what was planned for the next day, but went up to bed around 11pm and ended up reading an Indy 500 suvineer issue of Sports Illustrated that Patrick had left in my room. Another nice touch – can’t fault the man for attention to detail! The next morning we went to pick up some odds & ends from the store for Lisa. By way of making my trip to the states as complete as possible, Patrick took me to Walmart just for the experience. It was actually pretty cool – they certainly pack it high and sell it cheap. 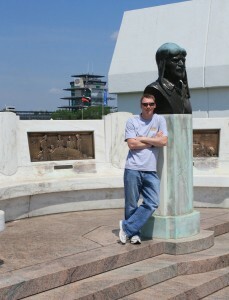 I scored myself a cool Indy 500 t-shirt for just $12 – not too shabby compared to the $20-$25 prices at the official store. We then had a good laugh trying to pick the right re-seal-able plastic sandwich bags for Lisa. She’d given us strict instructions not to return with anything but the ones she wanted, but the choice was crazy! Patrick nailed it in the end, remembering the color(!) of the packaging and the rough size required. He assured me he never usually went to Walmart, and I could believe that – the sheer amount of choice for any given item was enough to make your head spin so you’d forget why you were there in the first place. Still, it was an experience! After dropping the goods at the house, we left Lisa to get on with preparing food for race day, and headed downtown to meet up with Patrick’s brother at the building his business, Summit Realty, operate from. 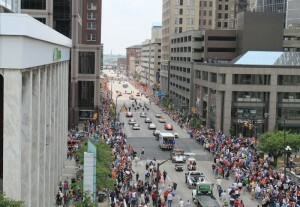 I’d seen it briefly on our way to the track the day before, but didn’t know it was on the parade route. Summit employees inhabit the 2nd floor and above, whilst the 1st floor is currently empty and made for a great place to watch the parade go by. Patrick had been in charge of bringing all the moving parts together that turned a near derelict building into a fantastic downtown office with loads of character. I could tell he was proud of what he’d helped put together for his brother, and he insisted on giving me a tour whilst the parade rolled by on the street below! In the end I got to see the final few rows of drivers go by before Patrick took me up to the roof to watch them disappear into the distance. Bit of a shame we missed most of it, as the sun was out and the roof was a great vantage point. Back on the 1st floor, Bill had got in a load of boxed lunches and soft drinks for whoever might turn up to watch the parade from the office. 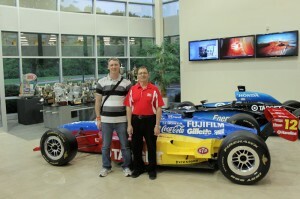 Chris was there too, and called the crew chief she knew at Ganassi HQ to see if she could arrange a tour for me. Continually impressed and humbled by the generosity of the family, I took a seat and ate lunch, seasoned with Indy 500 related chatter. When we’d cleared up after ourselves, we walked through downtown to Bill’s apartment, where we listened John Hiatt and shared a bottle of Andretti wine whilst Chris took a nap. Listening to Patrick & Bill tell tales of race weekends from years gone by, I couldn’t help but think I’d been supremely lucky in being Patrick’s guest for the week. Besides the Indy 500, this is what I’d flown all the way here for. To meet great people, experience the different pace of life in the mid-west, and to try and soak up as much of that as I could in the short time I was there. Patrick is about as laid back a guy as I’ve ever met, but the bigger picture is always taking shape in his head. I was actually fretting that Lisa didn’t know where we’d gotten to when he told me I needed to relax! 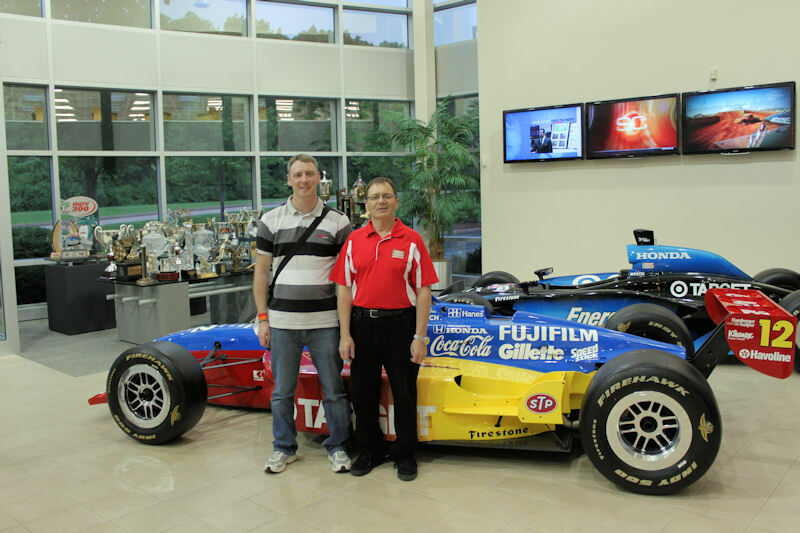 When Chris was up and ready we headed back to the house and switched to Lisa’s Honda for the trip to the Ganassi Racing HQ. The drive didn’t take much more than a half hour – mostly on the freeway. It seemed that just about everything was about a half hour away from The Y. 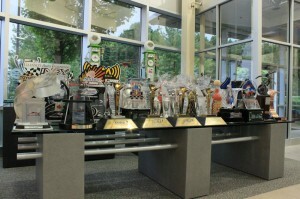 When we arrived at reception a large party was just departing, leaving the area mostly empty for me to take pictures of the numerous trophies adorning tables either side of the entrance. Chip Ganassi himself was there, chatting to a guest. I wanted to get a picture with him, but it seemed kind of rude to ask. When Gary, our host showed up, he led us into the main workshop area, where we took some of the last few glasses of wine from a serving area that looked like it had seen a long day of meeting & greeting sponsors and guests. The side workshops and machining areas were really impressive, and kept more like labs than workshops. I was on the assumption that I couldn’t take any photos in these areas, so kept my camera in the bag. A computerised laithe had been used to create perfect little replica wheels which had then been anodised, before the laithe took another 1/1000 of an inch off them to bring out the detail. A red string had then been added to turn them into yoyo’s, and we were presented with one each as a keepsake. I successfully managed to bounce mine off the floor trying to use it as a yoyo – turned out they were too heavy to work, plus the string was a bit long on them. We moved on through the facility until we got to the car storage area, which had championship winning or “obsolete” cars stacked on racks. Suitably awed I half-heartedly asked Gary if I could take pictures, expecting a negative reply, but he said I could take as many pictures as I wanted in this area. The reason I put “obsolete” in quotes before was because the DeltaWing concept car was hanging up to one side, and it could hardly be considered a relic! I was a big fan of the design when I saw the pictures and learned of what Ben Bowlby, the designer, was trying to achieve with it. Ultimately it wasn’t chosen as the next IndyCar, but I think the ethos of the concept is entirely valid. Bowlby had designed a car capable of going as fast as the current Dallara, but with half the horsepower, making it more fuel efficient and more relevant to the direction of today’s car industry. 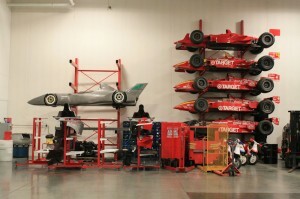 It was kind of sad to see the DeltaWing hanging up in the corner, so I took a load of snaps of it. I was happy to learn just a couple of weeks later that it’ll take part in the 24 Hours of Le Mans in 2012 in a entry slot specially designated for groundbreaking cars. After wandering back to reception via the wings & under-tray storage area, I got my picture taken with Gary before we left. He’d pulled an all night shift along with all the other workshop personnel in preparation for the race, so it was brilliant of him to give us a private tour at the end of a very long day. When we left we headed for Patrick’s brother Jason’s house to catch the tail end of his daughter’s birthday party. Lots of family & friends were there, and, as had become the norm, they made me feel very welcome. Laughing hard, they obviously sympathised with my plight at being kept in a constant state of wonder by their brother’s seemingly lax itenerary. The thing is, I’d been in his company for three days by this point, and had quite enjoyed the mystery unfolding. I knew the fixed points – my arrival, the race, and my flight home. Everything else was out of my hands and thus far I’d had the time of my life, all thanks to Patrick and his supporting cast. Returning to the summer room at the back of the house, I sat with Lisa, Patrick, Jason, Bill, and their father. Again the talk centred around the Indy 500. As the only motor sports fan in my family, I couldn’t help but feel jealous at how immersed they all were in the event. In my household I’ll usually get asked who won after the race is over, but that’s as far as it goes! 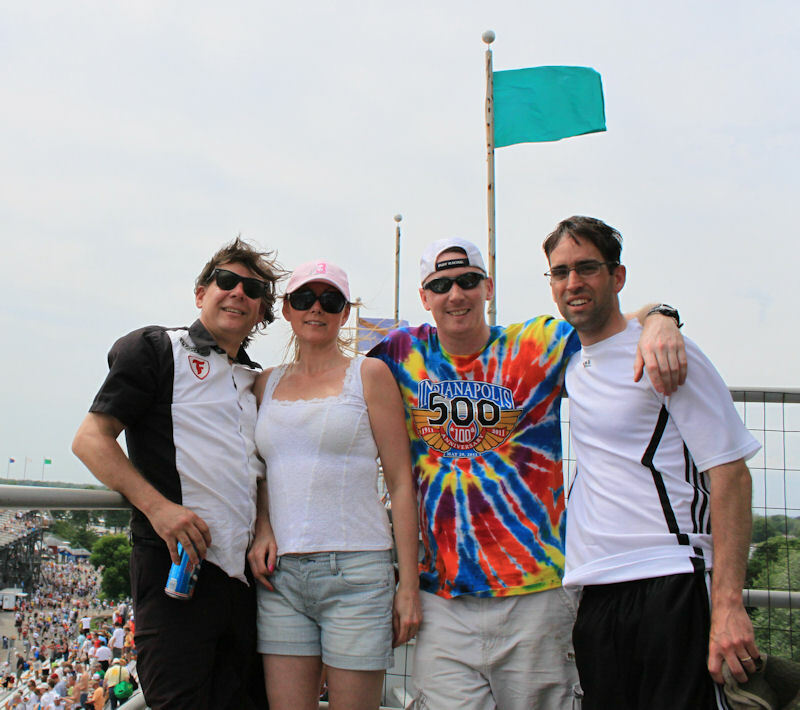 Jason told us that he’d gone to the Carb Night Burger Bash, where a guy from Seattle had won tickets to the ‘500 for coming from the furthest away. Upon learning that I was a bit gutted that I hadn’t got a second wind and convinced Patrick to take me there – I could have owned that guy from Seattle! We shot the breeze for a while before there was a consensus to head to The White River Yacht Club for their “Night Before the 500” party. On that note, it seemed like everyone and their dog was hosting a “Night Before the 500” party of some description, with every other house in the neighbourhood having a grammatically incorrect “welcome race fans!” banner outside. So much so that we crashed a party just a bit down the road from Jason’s because Bill seemed to know someone he saw on the lawn. It was dark by the time we got to the yacht club, which was unlike any other facility of the type I’d ever seen, and busy with lots of merry folk enjoying the atmosphere. Playing live was a band called The Blue Olives, consisting of some talented musicians, who together made up the most self-congratulatory band I’ve ever witnessed in person. Seriously! They’d play half a song of bluesy stuff, before playing time to stretch it out whilst giving each band member a shout out, then build to the finish of whichever song that everybody had forgotten they were playing. The first time they did it I thought they were finishing up so another band could come on. The second time I figured the same, but inside 30 minutes they’d played maybe four songs and given me the name of everyone in the band several times over, when what I generally expect a band to do is play some frickin’ music! As musicians they were pretty good – especially the sax player, who came with the added bonus of being female and hot. However, I just wasn’t drunk enough to enjoy 4 minute songs being stretched to 10 minutes long for the sake of a band with a big ego, so I was kind of glad when we called it a night. Knowing we had to be up early for the race in the morning, I really wanted to get home to bed, but Patrick said we should swing by the Coke Lot by the speedway to see how mental it was. He was right, too – nobody was getting any sleep on this particular camp site! After our tour of the crazies roaming the parties we swung by Steak & Shake for a midnight snack. We’d still have been home and in bed by half twelve at this point, before someone had the crazy idea of visiting the famous Long’s Donuts to stock up on treats for race day. So off we went on a twenty minute trip to find that Long’s Donuts was indeed closed at coming on for 1am on the night before the Indy 500. Can’t say I was shocked myself. I almost nodded off on the journey home, and I was out before my head hit the pillow when I finally got to bed. This trip certainly had a theme of burning the candle at both ends! When I woke on the morning of race day I was really tired, but knew we needed to head for the track good & early due to the volume of traffic. I was showered, dressed and ready to go by the time I found out that Jason was running about an hour late for picking us up. Although I could have done with the extra hour of sleep instead, it did give me time to wake up and get myself ready to drink in the day ahead. Heading to the track we hit traffic much earlier than I expected, but with a bit of local knowledge we were soon cruising the side streets of the neighbourhoods near the track. Patrick called this route the “shake & bake” – I don’t know exactly how much it shaved off the journey time, but given the density of traffic when we rejoined the main route, I reckon it was close to an hour. Every year, Patrick’s family parks in the same driveway & lawn of a family called the Hills. 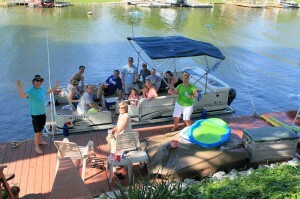 There, the atmosphere was good, as various family members and friends showed up after our arrival. Some of whom I’d met, some I hadn’t, but all were friendly and excited about the race. As we were preparing to leave I made the admittedly stupid mistake of spraying sun lotion into my eyes, thinking it’d be okay if I had them closed. This was not the case, and my eyes locked shut in pain. Bill’s son Adam was quick thinking and poured water into them to flush them out. They stung like hell, but I could see again and considering I’d come all this way to watch the race, that was the important thing! It was a decent walk to the track, with the sea of people growing in numbers exponentially the closer we got to the track. Even so, it wasn’t ever crazy, and we’d dragged ourselves and the coolers up to the top of the North East Vista by shortly after 10am. The view up there was amazing – just like Patrick had described. I could see all the way along the back stretch to turn two, all through turns three and four. Everything except the start/finish line and turn one, but the jumbo screen inside the infield would cover that. As with most American sporting events, the build up was full of grand ceremony. Behind us over the city we could see a stealth bomber circling in the distance, biding it’s time until its flyover scheduled for the crescendo of the national anthem. Way up high above us there was what appeared to be a spare one doing the same. To use an American sporting analogy – they cover their bases, I’ll give them that. I made a slight faux-pas of thinking my cap was attached to my camera bag when taps was played to salute the military personnel present, when in fact I had it on backwards due to taking pictures. Lisa had to tap me on the head a couple of times before I realised I had it on. I was mindful to take it off again when the national anthem kicked off, though. I quite like the US national anthem – it’s uplifting and stirring – just how they should be. Seal did an excellent job of delivering it, too, even if his female counterpart murdered it in the way that females always tend to do. That stealth bomber nailed his side of the bargain as expected. I’ve heard it on TV a bunch of times, of course, but when Jim Nabors sang Back Home Again in Indiana it was brilliant. The Hoosiers are rightly proud of this event and the song just encapsulates it with a sort of charm that’s missing at events like, say, the Superbowl, which is held at a different venue every year. When the command to start engines was given, the hairs on the back of my neck stood up another notch. This was where the rubber meets the road, as Patrick was fond of saying! I took lots of shots of the formation laps – it really was wicked to see the 33 cars all lined up nicely. As they came round for the final time before the green flag waved, I put my ear buds in and tuned my phone’s radio into the track broadcast. I’d decided not to get a scanner because I thought it might isolate me from the others if I was totally immersed in the race, but in the event we didn’t talk too much anyway. I think it was a good decision on the day, but I’ll get a scanner next time, if only to escape the adverts. The start was great, and as the early laps unfolded my prediction of a crash by lap ten proved unfounded. The racing was clean through the field, with some good dicing coming into turn three, right in front of us. With the strong breeze it wasn’t torturously hot in the stands. A couple of strong gusts had folk reaching to secure their hats, and it was one of those gusts that caused a crash below us that I missed entirely due to turning to talk to Patrick. I was glad of the radio as the race progressed, as it was hard to keep track of who was where just by looking at the ticker on the jumbotron. Shortly after the start I’d switched from the IMS broadcast to 1070 The Fan, as they were giving a bit more detail in their running commentary. The adverts came far too frequently, though, and led to lots of recapping after each break. Still, it was better than nothing and I was able to keep the folk around me informed of things like cars pitting unexpectedly, for example. At the mid point in the race, Patrick took a few shots of me in the garish tie-dye t-shirt I’d bought at the airport when I arrived. The guys who were standing beside me asked if I could take their picture and send it on, as they didn’t have a decent camera on them. I reeled off a bunch of pics and eventually sent them to him a few weeks after I got back – better late than never! The last 30 or so laps of the race completely threw things up in the air. So many drivers were gambling on fuel that their pace dropped off and some cars that had been up front for most of the race ended up mixed through the field. Scotsman, Dario Franchitti, who was one of my favourites besides Dan Wheldon, had dominated the race, but had slipped way back in the order having elected to try and make it to the end by saving fuel. With about 15 laps to go I knew his team had blown it when they mentioned a conversation between Dario and his team on the radio where he said he couldn’t make the fuel mileage number they were aiming for. At this point I didn’t know who was really a contender and who wasn’t, and neither did the guys on the radio. There was so much confusion going on that all I could do was shrug when the folk around me kept asking if I knew what was happening. The one thing I did know was that Danica Patrick, who was leading, wasn’t going to win – she needed to stop again for sure. So, unless there was a monumental crash that caused the race to be red flagged, our winner was coming from further back. Remembering the horrible crash from 12 months before, caused when Ryan Hunter-Reay’s car ran out of fuel in front of Mike Conway’s going at full tilt, I actually expected an accident some sort, as the closing speeds between those at racing speeds and those saving fuel was just dangerous. Nobody could have predicted what happened at the end of the 100th anniversary race, though. I watched the leader, JR Hildebrand pass beneath us and enter the final corner behind a back marker. As my eyes looked back to find Dan Wheldon I saw Hildebrand hit the wall on the jumbotron, Wheldon passing beneath us in the meantime. I joined the rest of the crowd in being open mouthed with my hands on my head in disbelief at what was unfolding. The radio announcers in my ears were just as shocked – “He’s hit the wall – Hildebrand has hit the wall, but he might still win it!” Unable to see the start/finish line from our vantage point, I had no idea what was happening, and neither did the announcers until after the winning car had crossed the line. “It’s Wheldon! 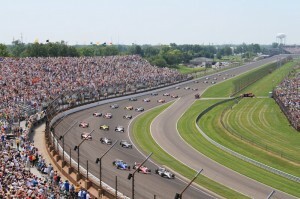 Dan Wheldon has won the Centennial Indy 500!” Came the call. I jumped up and down in excitement, arms raised, ecstatic that my favourite driver had won, but still stunned at the dramatic final moments. Wheldon had only led the race for 100 yards, but he’d crossed the line first with Hildebrand’s wounded Panther car limping over the line in second. Unbelievable! It was only when it was confirmed that all the stories started to unfold inside my head. Dan Wheldon had just beaten the car he’d driven to second place the year before, driving a one-off entry by Bryan Herta Autosports after Panther Racing had acrimoniously dumped him at the end of last season. Wheldon doesn’t even have a full time ride this year – the Indy 500 was the only race he’d signed up to do, and he’d won it. Incredible! Listening to Dan’s post-race interview was great. He’s always been respectful of the history of the event, and has been anxious to win again after he took victory in the 2005 running of the race. The past two years he’s finished second, and the fact he ended up out of a job made it seem like his chances of winning another 500 were diminishing. Although a lot of the crowd started making their way toward the exits, we were in no rush to leave and it was great to see all the post-race stuff, like Dan getting awarded the Corvette pace car and being driven around the track to salute the fans. Jason had come up to join us whilst the stands cleared, so I took the opportunity to get a picture of us all together at the top of the North East Vista – the best seats in the place as far as I was concerned! It was such a perfect day and a perfect race from my perspective. The action was good, there were no bad accidents, there was sensational drama at the end, and my favourite driver won it. Taking a final few pictures from the North East Vista, we made our way back to the Hill’s place to meet with the others. On the way we bumped into Chris, who runs IndySoup.com, and took some photos with him. Once back on the lawn I got a cold water bottle to hold onto my wrist, which had got badly sunburned during the course of the afternoon, as my watch had rubbed the sun lotion off. Holding my camera in that hand and being transfixed by the race, I hadn’t noticed the sun taking its toll. Gradually the others assembled by the cars or sat in the shade on the lawn, with the talk being centered around the dramatic end to the race. Once the roads had cleared we made the drive to take Patrick’s father home, before Jason took us back to The Y in turn. I was tired and quiet on the way. Patrick asked me if I was okay, and said I seemed kind of mellow. I told him I was just happy and at peace now that I’d finally seen the race after spending such a time just longing to attend. 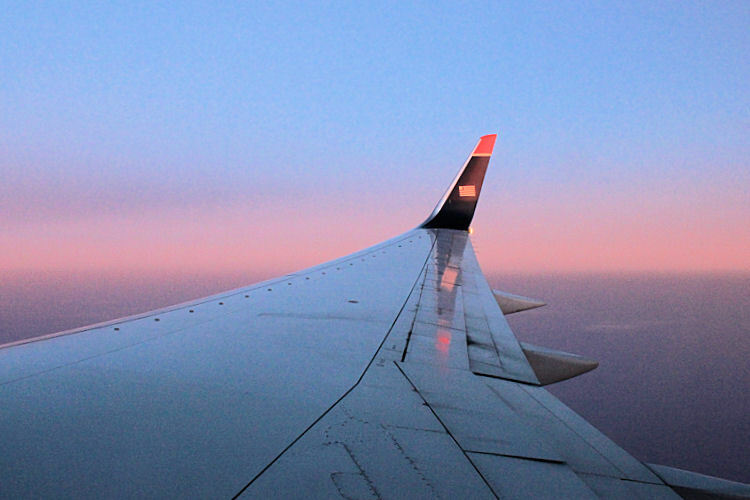 It’s not often I take this kind of gamble – flying off to stay with someone I hadn’t even met. But for it to pay off so perfectly in such spectacular fashion was just so amazing I could hardly believe my luck. So after my first sleep-in of the trip, we hit the road for the hour’s drive north to Heritage Lake. 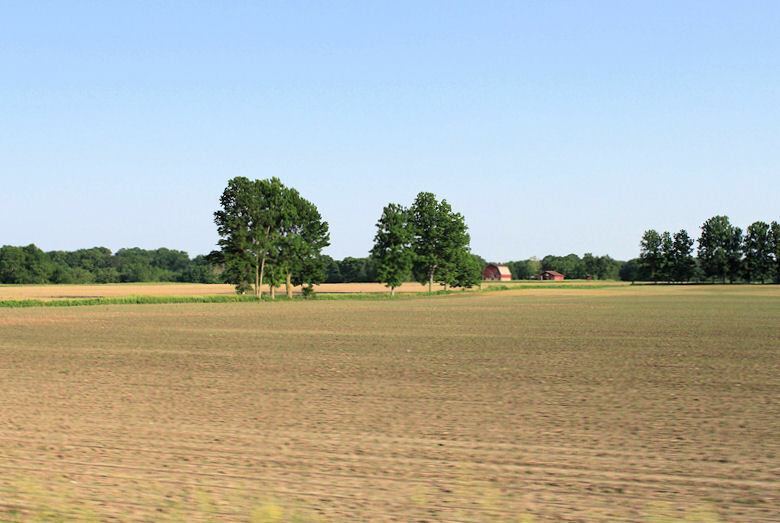 The scenery on the way was fantastic – lots of rolling hills consisting of seemingly endless farmland. Patrick assured me on the way that the lake was nothing compared to the lakes I was used to back in Scotland. Having already fallen for the goat ranch talk, I wasn’t so ready to have my expectations set low. When we arrived there were various members of the extended family there, as well as friends of Patrick’s mother. Lots of cooking had been done in addition to the stuff that Lisa had brought with us, so the first thing we did upon arrival was eat. Patrick’s mother insisted I had one of her brat’s instead of a regular hot dog, so I ended up having both due to picking wrong the first time! The weather was absolutely scorching. My left wrist was burned pretty badly from the day before, and I was nervous about making it worse and having to endure the irritation on the flight home. There’s nothing worse than travelling with sunburn, so while some of the others ate out on the decking I kept myself mostly to the air-conditioned lounge of the house. Soon there was word of heading out on a boat. Patrick said his mother’s boat was pretty slow and we’d be bored to tears cruising around the lake on it, so when some friends turned up with a boat that could shift, Patrick got us invited aboard. I was a bit nervous about this, as I’m not a boat person, nor am I a water person. Still, it proved to be a fun afternoon gliding about on the lake which, although it wasn’t quite Loch Lomond, was sizeable enough and surrounded by lush green banks, upon which sat impressively large and expensive houses. Patrick explained that people used to have these as summer houses twenty or so years ago, but nowadays folk lived here all year round and made the most of the lake when the weather got warm. It was such a perfect setting that I felt kind of jealous of the lifestyle being enjoyed by everyone on and around the lake. Sitting in the boat with the realisation that this kind of lifestyle is beyond my means, it felt like the part of a pleasant dream where something too good to be true happens and you suddenly realise that it is just a dream. And this was one I would have to wake up from when I went to the airport the following day, but still, it was nice to pretend for a little while that I belonged out there. Back at the house I was ready for some more food, and had another brat’ along with some salad and a couple of the biscuits Lisa had made. There was so much good food on the go that I felt the Scottish shortbread I’d brought with me was a bit of a weak effort. Patrick’s mother seemed pleased to receive the nice tartan tin, though, so that was all the approval I needed. I had been tempted several times to get in the water, as it seemed a shame to be visiting a nice lake like this with my swimming shorts on and not take advantage of it. So I went back down to join the others down by the dock while I thought about it. The kids were tirelessly swimming around on foam noodles and going down the slide to land in the water. It looked like good fun, but in the end I decided not to take the plunge after just eating again. It was kind of cool to sit around with everybody on the boat and just chat, though, so I used the Gorillapod to clamp my camera to the stair rail and set it up to reel off a load of pictures. As with all group photos, it’s unusual for everyone to be looking in the right place at the right time, but the one I posted here has most of us looking at the camera and it’s a great memory of how warm and friendly everyone was. Bill said he’d met this group of people in a bar one time and when they got talking it turned out they didn’t have a place to stay. So he invited them to stay at his place. That had been over thirty years ago and the same family had been coming back to visit ever since. “You could be the new Nicholsons!” Bill said. I thought this was both hilarious and completely unsurprising – I don’t think I’ve ever met such a wonderfully friendly family. Even if you make a good first impression, most people take time to warm to folk and invite them into their homes, but Patrick’s family just made me feel like I belonged with them right away. Me, Chris, Patrick, Bill, Lisa, and Adam enjoying an Auchentoshan in the kitchen! I had brought a bottle of Auchentoshan Whisky with me as a gift for Patrick, but he said he wasn’t so keen on whisky and it had been suggested whilst we were listening to John Hiatt on the Saturday that I could let Bill have it for his birthday. Bill said he’d let me have a bottle of Andretti wine in exchange for it. Today was Bill’s birthday and I’d brought the bottle as promised. 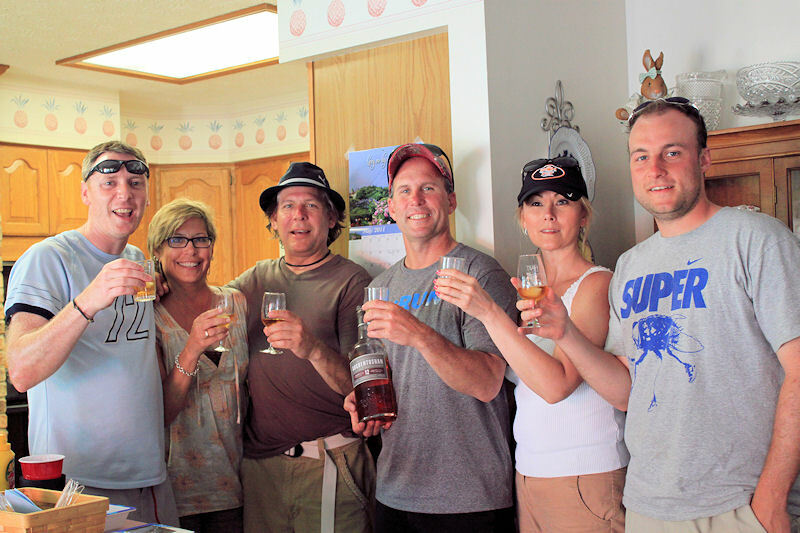 After we’d gone up to the house and sung happy birthday to Bill, he poured a double measure of the whisky for anyone that wanted some. I’ll concede that I’m not a huge whisky drinker myself, but it went down smoother than I expected. Bill and Patrick seemed to love it, though, with Bill tucking the remainder of the bottle into his bag to take home with him and Patrick helping me finish my glass! Things wound down pretty quickly after the whisky, as both Patrick & Lisa had to be back at work in the morning and we had to get back to The Y. It was a lovely evening for the drive, and we took a scenic route so I could grab some pictures of the “real mid-west”. Still, it was good to roll through a small-ish town and see some stuff off the beaten track. Unfortunately we didn’t stop so I could get out of the car to set up properly, and most of the photos I took out of the car window weren’t very good. Still, I’d taken a whole lot of pictures during the time I’d been in Indiana and I’ve captured the things that were most importnat, which are littered throughout this post. Back at The Y I sat about talking with Patrick before heading to bed early. I had another scan through that Sports Illustrated he’d left in the room for me before I hit the hay. It was hard not to feel sad about leaving when I woke up on the Tuesday morning. I had my shower and packed up my bag reasonably early, making sure I had every single little trinket I’d picked up during my stay – the golf ball I’d hit the furthest, the pretend AJ Foyt money from the parade, my ticket to the race, and, of course, that Sports Illustrated. I did ask for that first, just in case, but Patrick said I could take it. I knew he had work to do so I wasn’t worried when he dropped me at the airport. As far as I was concerned he’d so over-delivered on his promise to take care of me that it felt kind of selfish taking up any more of his time than I should do. Still, Patrick said he’d run me by the speedway one last time, and it was such a beautiful day for some final pictures that I was happy with that. On the drive to the track he made some business calls, and it was quite interesting to listen to the change in character from how he’d been for the duration of my visit. 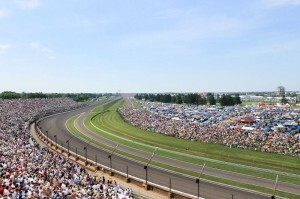 For the weekend of the Indy 500, everything just fell into place in a seemingly effortless way. The man is like a swan, I think – on the surface it looks ridiculously easy for him, but his mind is working all the time behind the scenes. 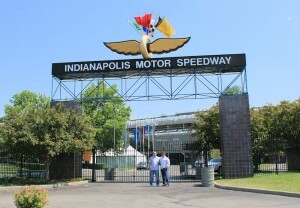 Arriving at the track, the conditions were perfect for getting a picture of the main entrance. Initially we were the only people there, but another car turned up with some girls who wanted to take some pics in the same spot, so I took their picture and they returned the favour. I thought it was kind of fitting that on the first proper day of my visit we had our picture taken on the yard of bricks, and here we were just a couple of hours before I left having our picture taken under blue skies at the entrance to the speedway. The whole trip had revolved around the track and the centennial race, but I had made a friend for life at the same time, and it was a common appreciation for the Indy 500 that had brought us together. We swung around and under the short-chute to park up by the museum so I could get a few more pictures of that in the great conditions. It was great to see it this way after how overcast and damp it had been at the tail end of the past week. After a final wander round the museum we headed for the airport. I told Patrick just to drop me and go, as I appreciated he had a meeting to get to and I didn’t want to hold him up for any longer than I had done already. I waved him off at the airport and checked in at the US Airways desk inside the door, then wandered through airport security, where the security staff were friendly and polite – just like everyone else in the Hoosier State. I told them so, too, and they thanked me for saying so. Whilst I ate a burger for lunch in the airport bar, I posted on Track Forum to say that if everyone in the world was like the people of Indiana it’d be a much friendlier planet. On the flight to Philidelphia I got talking to a retired professor who now lived in Florida, and he too had been to see the race. I craned my neck to see out of the window just after take off and he asked what I was doing. “We must be heading south.” I said. “I’m sure the pilot knows where we’re going – once we’re in the air I don’t worry about it, there’s nothing I can do anyway.” He told me, somewhat sternly. We had a good chat after that about anything and everything, with him doing most of the talking and me listening intently to his stories. I love this side of travelling – you never know who you’re going to meet or what you might learn from them. I spent the time at Philidelphia airport in a different bar from the one I’d stopped at on the way in. It was there that I realised I shouldn’t have had the burger before the first leg of my flight home, as I was too full to justify ordering a Philly cheese steak. There’s always next time for that, I guess. The rest of the flight home was fairly uneventful, save for some turbulence that had the pilot tell us to put away our laptops and whatnot. Fortunately I’d done so much work on the way out that I was just about finished the freelance work I had to do, so I packed up and tried to get some sleep before my early morning touchdown. It was damp and overcast when we landed at Glasgow. Not much can bring you back to Earth after the holiday of a lifetime than realising that home is just the way you left it – wet and cold. Still, it was good to be back and see my family again. Elisha appreciated the t-shirt and little cars I’d got her, and the top I got for Fliss appeared to be the right size for a change. I’ve been back home from Indiana a month at the time of writing, and my memory of the details of my trip have faded a little bit. Hence the reason for this ridiculously long post. I want to be able to go back and read about this trip in ten or twenty years time and jog my memory of all the great little things that happened to make this trip one of the highlights of my life. I’ll finish by thanking Patrick once again for making it happen, and his family for welcoming me with open arms. I hope some day I can return the favour.